Police said the chances of finding the 28-year-old Argentine alive were “extremely remote”. Flowers and tributes are placed near a giant picture of Argentine soccer player Emiliano Sala outside the FC Nantes training camp yesterday. BRITISH INVESTIGATORS ARE probing the licence held by the pilot of the small plane carrying Premier League player Emiliano Sala that went missing over the Channel this week. The light aircraft transporting the 28-year-old striker, who signed for Cardiff City last weekend, disappeared from radar around 20 kilometres north of Guernsey on Monday night. The local coastguard on Wednesday named the pilot, the only other person in the plane, as David Ibbotson – a 60-year-old married father of three from northern England, according to reports. Sala, who signed on Saturday from French club Nantes for a reported fee of €17 million, was flying to Cardiff in a single-engine Piper PA-46 Malibu aircraft registered in the United States. Rescue workers formally called off the search for the missing plane yesterday, prompting Sala’s sister to make a desperate plea for its resumption. The family’s calls for the search to recommence were echoed by Lionel Messi and other players including fellow Argentines Gonzalo Higuain, Nicolas Otamendi and Lucas Biglia. “While there is the possibility, a shred of hope, we ask that you please #NoDejenDeBuscar (don’t stop searching) for Emiliano,” said Barcelona attacker Messi. Nantes coach Vahid Halilhodzic said Friday that it was “disgraceful” that the search had been called off as he knew “in his heart” that Sala was still alive. “It’s disgusting to leave the situation like that,” Halilhodzic told reporters ahead of his team’s first match since Sala disappeared, a French Cup tie with third-tier Entente Sannois Saint-Gratien this weekend. The Premier League announced yesterday that there would be a “moment of silent reflection” in tribute to Sala before next week’s fixtures. However the French League said they had no plans for a similar commemoration at this week’s Ligue 1 matches. 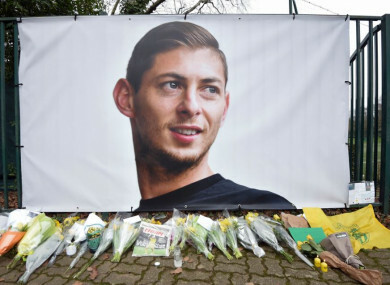 League president Nathalie Boy de la Tour said the decision was taken out of respect for the “desires of Emiliano Sala’s parents and loved ones” who believed he could still be alive. Email “British investigators probe licence held by pilot of missing Sala flight ”. Feedback on “British investigators probe licence held by pilot of missing Sala flight ”.